Mycoplasma infections are known to elicit numerous deleterious effects upon cells. Unlike other bacterial or fungal contaminants, mycoplasma infections do not manifest themselves in terms of pH changes or turbidity in the cell culture medium. Although agar cultures as well as DNA fluorochrome staining methods can be used for Mycoplasma detection, polymerase chain reaction (PCR) is the established method of choice for high-sensitivity detection. The MycoScope� Mycoplasma PCR Detection Kit utilizes PCR to detect mycoplasma infections in cell cultures in less than three hours. 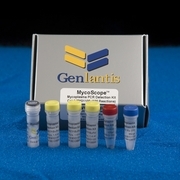 With the highly sensitive PCR assay, the MycoScope kit is capable of detecting less than 5 mycoplasma genomes per microliter of sample. The primer set supplied with the kit is specific to the highly conserved 16S rRNA coding reagion in the mycoplasma genome, allowing for detection of all mycoplasma species commonly encountered in cell culture. Mycoplasma contamination is a serious threat to cell culture based laboratory research. Studies have found as many as 85% of cell cultures tested show signs of contamination. This is not surprising considering the multiple sources of contamination, such as serum, media, additives, laboratory personnel, and faulty equipment (tissue culture hoods or incubator chambers). Mycoplasma�s negative impact tends to go unchecked due to the difficulty in detecting these ubiquitous bacteria. Widespread Mycoplasma contamination in a cell culture laboratory can lead to costly and time-consuming clean-up procedures Thus, it is highly recommended to perform regular screenings, and proven disinfection methods if mycoplasma contamination is found.